Sticky bombs have something of a prickly, explodey image, something that Valve decided it needed to fix. If, like a certain cyclopean, booze-filled, grenade-carrying Scotsman, you have a fondness for Team Fortress 2's sticky bombs, and secretly harbored dreams of having one of your very own, then today is your lucky day, as Valve has unveiled a pair of sticky bombs plushies for people to spend their hard earned cash on. The plushies are about 4.5" wide, with the spikes adding an extra inch all over, and are available with both Red Team and Blu Team coloration. 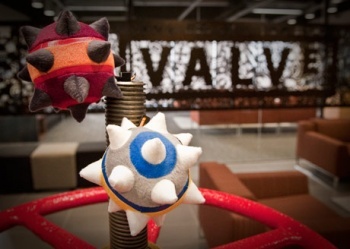 You can grab your plushie of choice from the Valve store for fifteen bucks and Valve guarantees that they will not detonate, as it has replaced the dangerous explosives with harmless glass and razor blades. Sadly, they won't stick to anything either, so you'll have to scrap any plans you might have had about laying fiendish plush traps for people. Every Valve franchise that could really accomadate something plush - soft toys designed to look like the terrorists from Counter-Strike probably aren't a good idea - now has something plush, so I'm rather hoping Valve will do another sweep of some of its older series. Might I suggest a plush Dog?